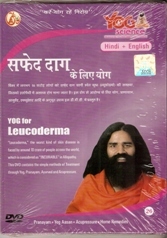 This DVD contains Pranayams, Yog assanas, Acupressure and Home remedies for Leucoderma. "Leucoderma" is one of the worst kind of diseases in the world. Apprximately 10 crore of people around the world are infected by this diseases, which is "INCURABLE" as per Allopathy. The reason for Leucoderma could be sentries heredity factors, having milk with salt or other "contra indicated food" etc. The simple method described in this DVD like application of cow's urine, cow dung and other yogic treatments are effective in curing of lacs of people and providing them full relief. Leucoderma in youngsters and childrens generates a depression in them, which hampers in development of mental and physical growth.